Spokane's greatest home furnishing store. Pianos, phonographs, records. Your credit is good. Gifts that have lasting value. Of all material things that surround us, furniture, furnishings and music have the greatest lasting influences on our daily lives. Easy terms are offered here. 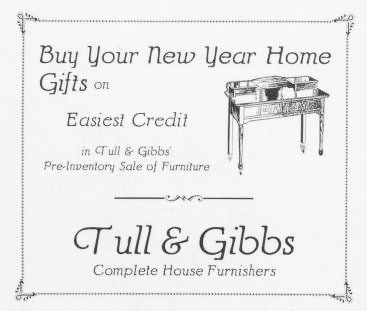 Build your new year home gifts on easiest credit in Tull & Gibbs' Pre-Inventory sale of furniture. 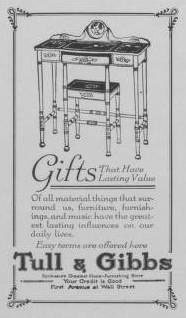 Complete house furnishers. Your Credit is good. All you need for your home comfort. 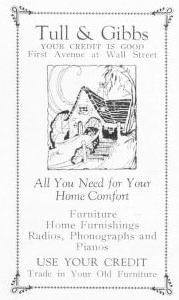 Furniture, home furnishings, radios, phonographs and pianos. Use your credit. Trade in your old furniture. 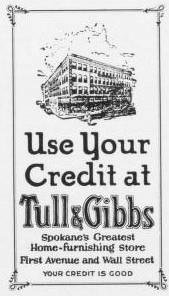 Use your credit at Tull & Gibbs. 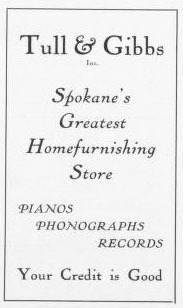 Spokane's greatest home-furnishing store. Your credit is good.